Daniel B. has lost over 60 pounds on the Naturally Slim program, but according to him, the physical weight loss was only a part of his story. “I have always been an active person. When my oldest child was born, I weighed 175 pounds and was running 3-5 miles a day. Years of shift work and the stresses of life saw me gradually adding pound after pound. At times, I managed to stall the gain, but I never managed to get rid of the weight. Four years ago, I ran a marathon and dropped about 15 pounds. However, my body and my lifestyle didn't really change, so when the training stopped the pounds came back. I was struggling with some important relationships, and few, if any, of my vital needs were being met. I worked on my needs and relationships, making substantial progress, but my weight was out of control. I felt bad most of the time. I was unable to do many of the things that I enjoy in life, and even simple tasks were difficult. Then, there was the pain in my hip. I couldn't lift my leg high enough to get dressed without excruciating pain. I saw the window of options in my life shrinking to the point that I began to wonder if it wouldn't be better if my life was shorter. There were no lasting solutions to the pain, I couldn't do many of the things that I enjoyed. I seemed unable to stop the weight gain. My blood pressure was getting high. I avoided getting my sugar levels tested because denial seemed better than more bad news. When I saw a doctor earlier this year who diagnosed me with early stages of arthritis in my hip, I weighed an uncomfortable 278 pounds. I was depressed. I wasn't sleeping. 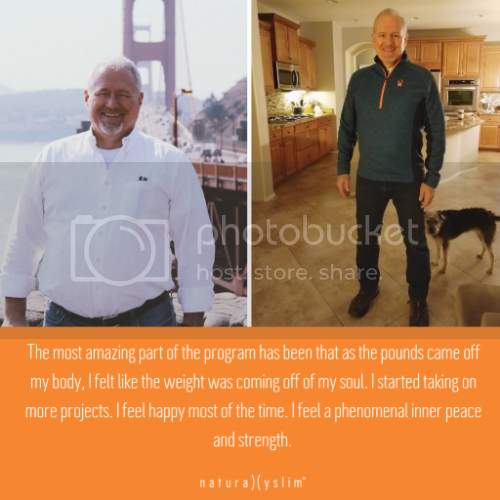 My future seemed so bleak that I started praying for a miracle, and that is when I noticed an announcement to apply for the Naturally Slim program through my employer. I debated whether or not I should give it a try without really knowing anything about the program, but I felt strongly impressed that it was the answer to my problems and my prayers. What if it was something that I couldn't do or something that required some odd behaviors? Was I willing to make the 10-week commitment? I decided to take a leap of faith. I was desperate for a solution. I remember feeling completely lost 20 weeks ago as I watched the first videos. Stepping on the scales that first morning, I weighed 269.7 pounds. I had only eaten one meal the day before because I was embarrassed to start the program at 270. When Marcia explained that I needed to eat slowly, eat small portions and stop when I was comfortably full, I thought, "OK, I can do that." She asked me to commit to no sugar for 3 weeks, and I thought, "OK, I can do that too." I started using small plates. I compared my servings to my loosely held fist. I used the 10-5-10 timer religiously, and I avoided sweets. I tried to understand my hunger patterns and the 4 levels and continually felt lost. However, I stayed committed. As you can see from the chart, this journey has had its ups and downs. While I never had a week where I gained weight overall, my weight certainly fluctuated up and down. There were weeks with dramatic weight loss and others with less than a pound. 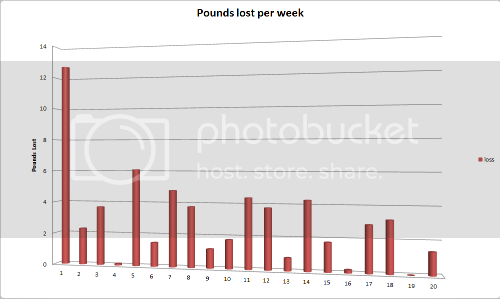 In week 19, I didn't lose any weight at all, but I didn't gain any either. At the end of week 10, I burned my bridges by cleaning out my wardrobe of clothes that no longer fit. I had dropped from a size 40 waist and XXL shirts down to a size 36 and XL. By the end of week 16, even though I didn't lose any weight that week, my waist size had dropped to a 34 and my shirt size to a large. The weight loss is only part of the story. After the first week, I started feeling much better. I was sleeping better. I woke up feeling refreshed and full of energy rather than achy and sluggish. After another week or so, I noticed that my hip didn't hurt. By week 7, I was ready to take up Todd and Tim's challenge to exercise. While it isn't the ideal time, I go to the gym almost every evening around 8:30 or 9 PM. I usually make it 6 days each week for about an hour (sometimes a little more). The most amazing part of the program has been that as the pounds came off my body, I felt like the weight was coming off of my soul. I started taking on more projects. I feel happy most of the time. I feel a phenomenal inner peace and strength. I have learned to be more disciplined and resilient, not only in my eating but in every other aspect of my life. My relationships with loved ones have improved. My outlook on life and the future is brighter than ever. I have the strength and energy to do things that I previously thought would no longer be possible for me to accomplish. I have learned to live in the truth. I have learned to act mindfully. I have learned to enjoy the feeling of being hungry and pushing the boundaries of what it means to me. I have learned to eat only when I am truly hungry. I understand my body's needs so much better than I ever have before. Thank you for sharing your inspirational journey, Daniel!